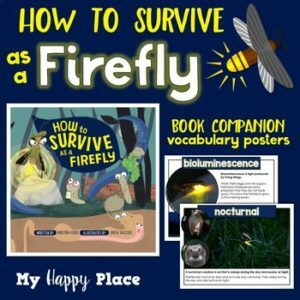 This freebie includes five vocabulary posters that supplement the book How to Survive as a Firefly by Kristen Foote (illustrated by Erica Salcedo). The posters include photographs, definitions, and examples of vocabulary words from the book. The posters are also included in a smaller (quarter page) flashcard size. The included vocabulary words are: metamorphosis, nocturnal, bioluminescence, insect, and predator.These vocabulary resources are useful for inclusion in a science center or as part of a unit on insects or life cycles. How to Survive as a Firefly is an entertaining and educational picture book that combines cartoon-like illustrations, humor, and lots of facts about fireflies. This book is full of tidbits of knowledge that range from simple facts to more complicated scientific details. Book images created by Erica Salcedo are used with permission from The Innovation Press.